Brilliant Moments in the WOODS | Lord...What's My Motivation? My favorite line in INTO THE WOODS has always been the Witch’s “I was just trying to be a good mother.” It’s widely received (on the stage anyway) as a laugh line to transition a moment. But in Rob Marshall’s version of this story, it’s a poignant, remarkable bookmark that made me almost tear up sitting in the Red Rock Regal Cinema. You see, everyone LOVES Sondheim. (And if you’re a theatre person and don’t…we’ll stone you to death.) But, the thing is…WHY do people love Sondheim? As a patron, is it his release from formulaic musical convention? As an artist, is it the challenge of skillfully crafted material? As a young actor, is it the blood, bad buys and nuances that are so much fun to love of hate? I think the answer is YES on all accounts. But, I would ask you to look past all of this for one moment…and look at the relationship between WORDS and MUSIC. 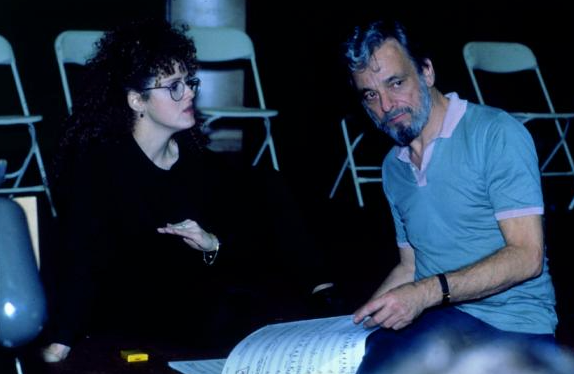 Bernadette Peters (the Original Broadway WITCH) rehearses with Stephen Sondheim. The Central Park INTO THE WOODS. 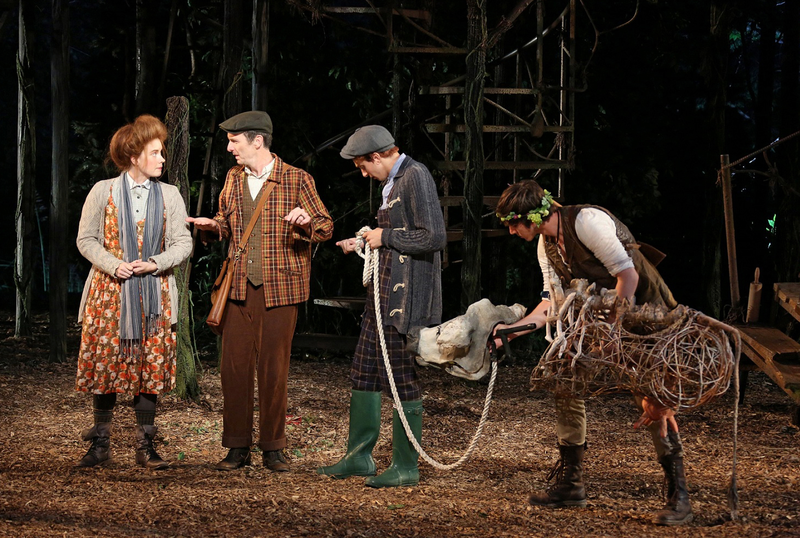 Roundabout Theatre’s INTO THE WOODS. 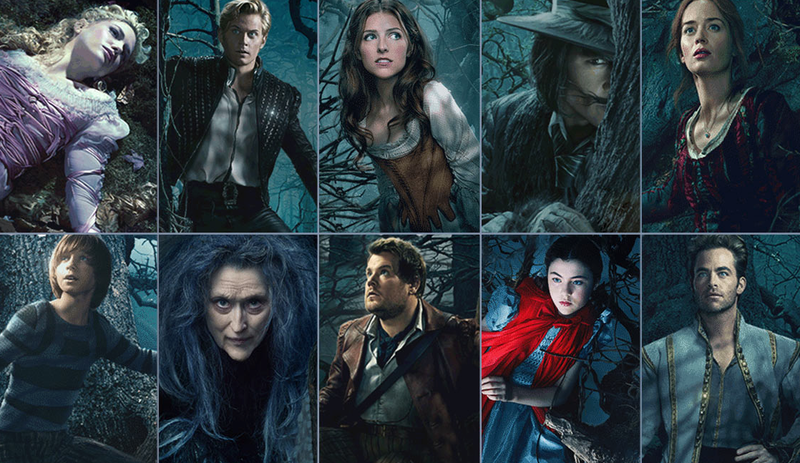 The cast of Rob Marshall’s movie version of INTO THE WOODS. The fact that there wasn’t a single title or credit at the beginning of the movie…brilliant. Immediately it plunked us down into this world. Before we could blink an eye…we were 20 minutes into the film and all of the exposition was laid out for us and we were actively engaged. The contemplative “On the Steps of the Palace” was whimsical and perfectly staged as a moment in time. How often have we scrambled our brains to make a decision in a heartbeat…millions of times throughout a day? How wonderfully theatrical of our director to present this song in such a way, and deconstruct the moment that we all know as a simple act of leaving a shoe behind. Fun stuff. The Princes’ song “Agony” (a borderline stereotype portrayal of the rugged and babyfaced Princes we all know from their respective stories) found two very likable characters temper-tantruming through splashy waters as they gaze upon their kingdom. It was thoughtful, well-filmed and hilarious. You INSTANTLY championed these two devise characters. 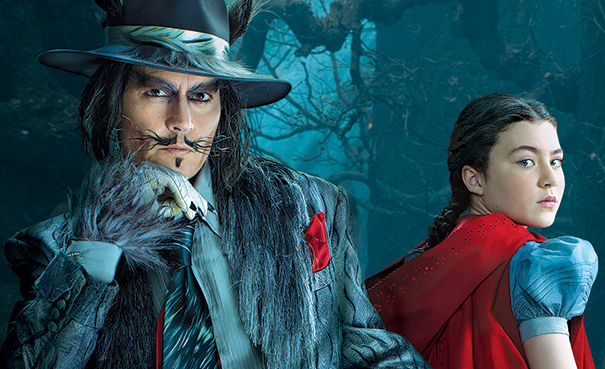 There is a danger in putting Johnny Depp as the Wolf. Who doesn’t love Johnny Depp? Those not familiar with the show may be heart-broken to only see him for ten minutes of screen time and catching stills from the set prior to watching the movie made me nervous. In performance, traditionally the Wolf is either portrayed as a personification of the age-old lesson of “don’t talk to strangers” or as a evil man of some kind, because all men are dogs…or, rather, wolves. The publicity photos saw Depp as a sort of Zoot Suit wearing gigalo. (Aside from the addition of some fun fur…Depp kinda looks like he was taken right off the street in his usual wears and onto the movie set!) I was pleased to see that HOW Depp portrayed the Wolf. It was very wolf-like…darting between trees to catch a glimpse, his trademark sneer when offering a sprig of flowers to the girl….it was VERY fun. I didn’t care how he was dressed…all I cared about was the fact that Depp was “the wolf” and how it was related was acceptable to me. Sometimes I wonder if I analyze stuff too much. HA! The kids were GREAT. 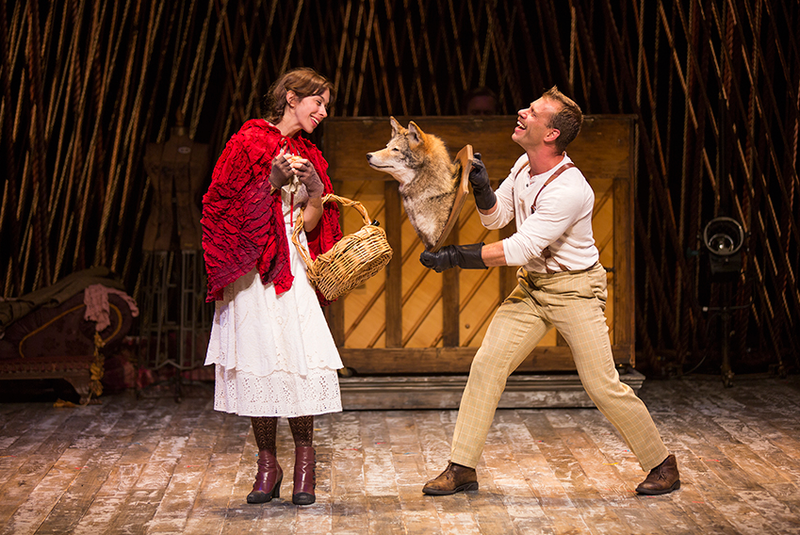 Daniel Huddlestone as Jack and Lilla Crawford as Little Red were perfect fits. (I would have loved a bit more snarkiness from Red…but, I’m being picky.) Emily Blunt is a superstar as the Baker’s Wife. James Cordon is adorable and sympathetic as the Baker. Everybody loves Pitch Perfect’s Anna Kendrick IN Pitch Perfect. They were quick to critique her in this film…but I would argue that she gave Cinderella the exact amount of torment. I was initially worried that she’d be too contemporary, but she was wonderful in the role. Tracy Ullman, Chris Pine….shoot, the entire cast was simply well-suited for their roles. Is there an award for CASTING a movie? I’m thrilled that another generation of could-be theatre goers will be exposed to this movie variation. It tells a great story and more importantly it relates (through WORDS and MUSIC) that truly no one is alone in their pursuit to communicate, be needed, protect and survive tragedy together. It’s a bedtime story and when the Baker is telling the tale to his son in the final moments…and the camera peels away…you desperately want to remain, a part of the audience. 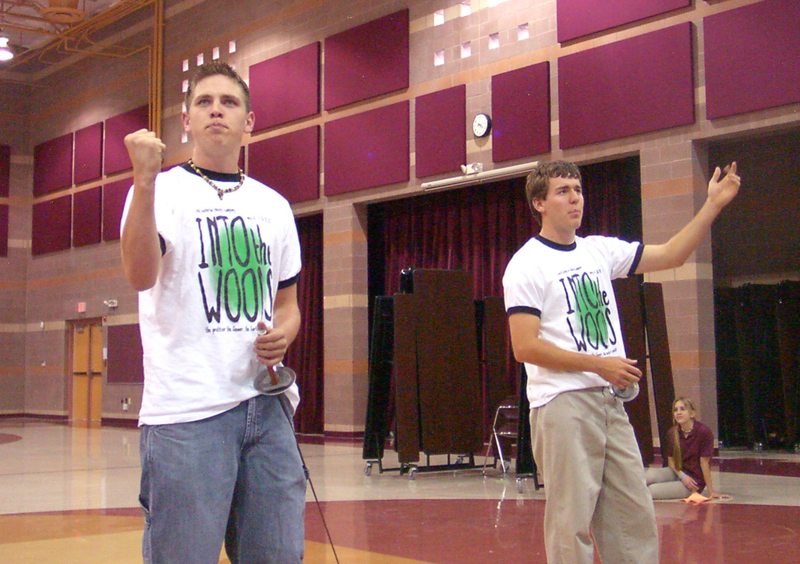 But no…our director takes us out of that world…and then for the first time presents the title: “INTO THE WOODS” reminding us it’s just a story. Wow. Brilliance. INTO THE WOODS is the story of all of our lives, (whether we’re Bakers, Princes, Witches or Giants) and can effectively remind us that at the end of the day, we’re all going into a world that presents dangers, and only together can we survive and more importantly thrive. I sit, poised and ready to purchase the Blue Ray upon its release. I have the projector in my classroom warmed up. This entry was posted on December 28, 2014 at 11:02 pm and is filed under ACTING ONSTAGE, REVIEWS, THE HIGH SCHOOL THEATRE CLASSROOM with tags acting, Baker, Baker's Wife, Bernadette Peters, Chicago, Cinderella's Prince, directing, Giant, Into the Woods, Jack, Jack's Mother, Johnny Depp, Little Red, Little Red Ridinghood, Movie Into the Woods, Movie Musical, Movie Review, Movie Review Into the Woods, musical, Rapunzel, Rob Marshall, Stephen Sondheim, Sweeney Todd, theatre. You can follow any responses to this entry through the RSS 2.0 feed. You can leave a response, or trackback from your own site. When you get the chance, you should see “Beautiful: The Carole King Musical”. Even though it may seem like a jukebox musical, it is more about a play with music about a woman learning to find her voice, and to find the light in every situation. Jessie Mueller is a wonderful goddess and truly is a natural woman. She is leaving the show on March 5 or 6, so you may not be able to see her. But the show is worth seeing!